Published Saturday, January 9, 2010, OK personal/derivative use; link www.lovethatimage.com. My sister brought me some flowers the other day and these gerbera daisies are still going strong. So cheerful in the Seattle “sunbreak” we had for a while this morning. See more interesting shadows at Shadow Shot Sunday. And more brilliant colors at Color Carnival. More straight-out-of-the-camera shots at SOOC. More yellow at Mellow Yellow Monday. More macros at Macro Monday. And more flowers at Flowers for Today! I’ve discovered that I’ve left incorrect links to some recent meme entries, and I apologize. I thought that by leaving the link to the category it would help people find things, but I didn’t realize that sorting by category disables the comment feature. No wonder it seemed so quiet out there! Sorry, everyone. I’ll go back to leaving the general blog url for most memes and let visitors find their way by category if they wish, or just by scrolling down a little bit. Please DO leave a comment if you feel so inspired; I love them. I’ll do my best to return the visit as soon as I am able. Since everyone likes this photo so much, and since I like it a ton also, I’m calling this my Best Post of the Week. Check out the cream of the blog week there. Oh, yes! Gorgeous flowers! And I love the colors! Definitely the perfect shadow shot!! Have a great weekend, Sara! Cheerful colors to brighten a dreary day. I really love how vibrant the colours are! That daisy is so gorgeous and beautifully composed! Nice burst of living color for this time of year, especially for those living beneath the snow level! The shadows leave a variety of shades of red on the flower. From a dusty rose to a deep ruby, the contrasts in lighting make for a beautiful flower! Some of my favorite flowers, too. Beautiful picture. I *really* like seeing the background flower on edge. Lovely shot that is so alive and cheerful. What a sweet and thoughtful sister you have. The flowers are lovely! I didn’t realise that by leaving a category link it would disable the comment feature. Wow, I learn something new everyday! Your flowers are certainly looking a lot better than mine this time of year…ha…what beautiful sunshine colors! Lovely shadow shot; lovely flower. Beautiful flowers, well lit and sharp focus. Nice! Stolen Shots is my entry. Have a blessed Sunday! Colorful choice, this week. Great shot. Gorgous glow of radiant colour! They do look rather lovely in the sunlight, don’t they? Very cheerful indeed! thats what we need a snowy white day like today, thanks for showing! It’s a relief to see something bright and blooming in the midst of all this cold, especially a gerbera, one of my favorites. I love the color of this one! These blooms always make me happy! Pretty! I love Daisies and the color is so vibrant too. Great take on this one thanks for sharing! Lovely photo of beautiful (large) flowers. I love it, Geberas are one of my favorites. I am a little jealous that your side of the state had a little sunshine, it has been so long I’m forgetting what it looks like. It is wonderful to see the sun on such a beautiful flower. Sara, Thank you for stopping by my blog today. It was very kind of you and I do appreciate your gentle words. The flower coloring is beautiful. I grew up in California and am now calling Colorado home. 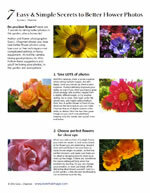 The timing for flowers to bloom and thrive is a short one so it is nice to see beauty in others blogs. 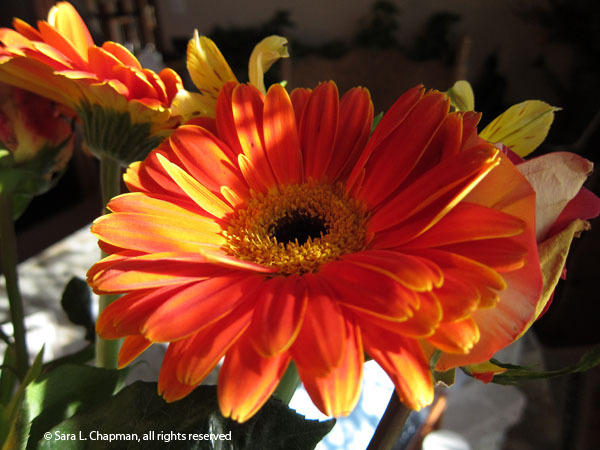 Wonderful gerbera daisies – they are just so pretty and I adore the rich jewel like colours!!! Great pic! I love gerber daisies. My daughter’s best friend owns a gerber greenhouse so I get bouquets of gerbers from her. They are like spring coming to visit! I can almost feel the sun on my shoulder by looking at this image. Pretty.